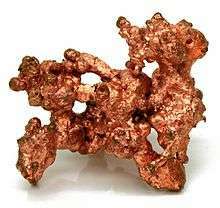 Nickel (Ni) is an element in period 4, between cobalt and copper. 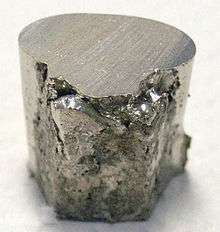 Nickel is rare in the earth's crust, mainly due to the fact that it reacts with oxygen in the air, with most of the nickel on earth coming from nickel iron meteorites. 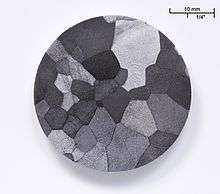 However, nickel is incredibly common in the earths core; along with iron it is one of the two main components. Nickel is an important component of stainless steel, and in many superalloys. 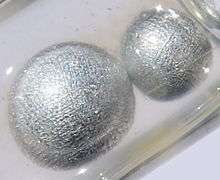 Gallium (Ga) is an element in period 4, between zinc and germanium. Gallium is noteworthy because it has a melting point at about 303 Kelvin, right around room temperature. For example, it will be solid on a typical spring day, but will be liquid on a hot summer day. 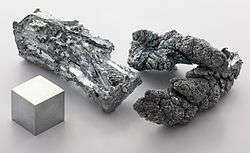 Gallium is an important component in the alloy galinstan, along with tin. 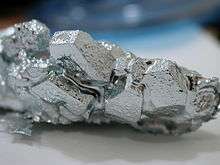 Gallium can also be found in semiconductors. Bromine (Br) is an element in period 4, between selenium and krypton. Bromine is a halogen, never existing in pure form in nature. Bromine is barely liquid at room temperature, boiling at about 330 Kelvin. Bromine is also quite toxic and corrosive, but bromide ions, which are relatively inert, can be found in halite, or table salt. Bromine is often used as a fire retardant because many compounds can be made to release free bromine atoms. ↑ "List of Elements of the Periodic Table – Sorted by Abundance in Earth's crust". Science.co.il. Retrieved 2012-08-14. ↑ "Elements in the Modern Periodic Table, Periodic Classification of Elements". Tutorvista.com. Retrieved 2012-08-14. ↑ "It's Elemental – The Element Potassium". Education.jlab.org. Retrieved 2012-08-14. ↑ "Potassium, Chemical Element – Overview, Discovery and naming, Physical properties, Chemical properties, Occurrence in nature, Isotopes". Chemistryexplained.com. Retrieved 2012-08-14. ↑ "Potassium (K) – Chemical properties, Health and Environmental effects". Lenntech.com. Retrieved 2012-08-14. ↑ "Reactions of the Group 2 elements with water". 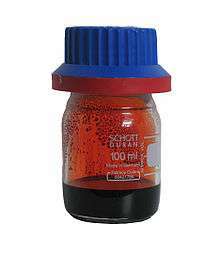 Chemguide.co.uk. Retrieved 2012-08-14. ↑ "Chapter 11. Calcium". Fao.org. Retrieved 2012-08-14.